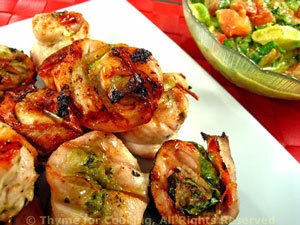 Grilled Pesto Turkey Rolls, Thyme for Cooking main course, quick and easy. Roughly chop the tomato and avocado. Tear large basil leaves, leaving small leaves whole. Put into a bowl and add the vinegar, oil and pesto.